As a leading manufacturer of cast iron and steel infrastructure products, J.R. Hoe proudly offers decorative bollards. Manufactured in the USA from high quality cast iron, our landscape bollards are available in a wide range of design profiles, sizes and mounting options. Our bollards are designed to provide excellent perimeter security while enhancing the visual appeal of the surrounding environment. Have a logo or design that would look great on one of our decorative bollards? Just send us your design and we can create a custom bollard for you. These custom bollards look great along the entrance of a building or by enhancing the landscape design of a theme park. Now, anywhere you see a bollards you can see custom bollards with a unique design. Cast iron bollards are often used to establish a protective barrier around buildings, parking lots and a wide variety of urban spaces. J.R. Hoe offers bollards that are installed over a steel security post to provide the impact resistance necessary to meet the required perimeter safety standards of virtually any project. 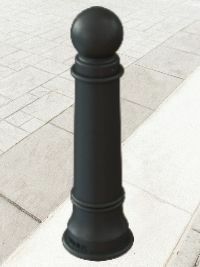 Our bollard design offers the combination of high quality cast iron and American craftsmanship for a product that is as durable as it is attractive. 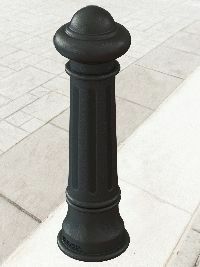 Decorative bollards are also used as an architectural feature to provide aesthetic appeal to public spaces of all kinds. Our landscape bollards are featured in public areas such as urban streetscapes, parks, building entrances and municipal plazas to delineate pedestrian boundaries while adding a refined and cohesive visual appeal to the setting. Bollards in these areas may be smaller in size and may be installed as a stand-alone option. Whether utilized for high-impact perimeter security or as an architectural feature in pedestrian walkways, J.R. Hoe decorative bollards provide the aesthetic and functional balance to meet the site-specific needs of any project.